TF is not perfect. Some team's schemes call for certain positions to be space-eaters and some to be play-makers. There are other shortcomings too, most of which are discussed in the comment thread of the original post. Despite its flaws, it can still give us a good sense of who has a nose for the ball. Also, TF really only makes sense for front-seven defenders--DEs, DTs, and LBs. For individual defensive backs, it tells us something completely different. In the future, it could be restricted to run plays or even to 'victory' tackles, which limits the analysis to how many tackles are made on plays that result in an advantage for the defense. This might make better use of tackle data for DBs. For now, we'll just look at front-seven guys. 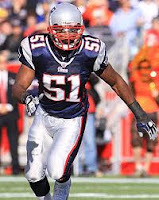 As an example, this season Jarod Mayo of the Patriots leads all linebackers with a TF of 1.87. This means that Mayo has recorded 87% more of his team's tackles than you would expect from a player at his position. To calculate Mayo's 1.87 TF, we start with the Patriots' total of 695 defensive tackles and assists this season. Mayo has 94 solo tackles and 49 assists, accounting for 20.6% of his team's total. LBs, whether in a 3-4 or 4-3 scheme, tend to get about 11% of their teams' total tackles. 20.6/11 = 1.87. Mayo has played in all 12 of the Patriots' games so far this season, so no game adjustment for him is needed. Here are the top linebackers, who tend to gobble up the most tackles of any position. There's the usual suspects: Willis, Lewis, Posluszny, and Urlacher. And Dhani Jones seems to be playing as much football lately as Does It Smell Anymore? DeMeco Ryans is one of the top LBs in TF, adjusted for only playing in 6 games. The Texans were 4-2 when Ryans went out. Since then they've been 1-6. Next up are the defensive tackles. Haloti Ngata leads all tackles with 1.46. Notice that Ahtyba Rubin has more total tackles, but the Ravens evidently have needed to make fewer total tackles to date. The Oakland defensive line looks pretty stout with both Richard Seymour and Tommy Kelly on the TF leaderboard. Usually it's good news when your defensive linemen are the ones making stops rather than LBs or DBs. Rookie Ndamukong Suh has a bunch of tackles to go along with his 8 sacks. The Bills' Kyle Wilson just missed the list, but he's actually tied with Suh at 1.31. Lastly, here are the defensive ends. Trent Cole leads the pack at 1.48. And wow, another Raider, Matt Shaughnessy is on the list. Some big names top the defensive end TF ranking, including Tuck, Vanden Bosch, Allen, Edwards, and former 1st round pick Glenn Dorsey. TF stats are available all season long and for previous seasons back through 2000. Just go to the individual defender stats pages for each position, and click on the TF header to sort. So what's better, a team where a few players stand out with a high TF, or one where everyone has a 1.0 TF, representing an evenly balanced defense? I would say one where the D-line has a lot of TF. That, usually, means that the runner is tackled close to the LOS. Brian, when are you going to adjust TF to run/pass ratio? I have to imagine a simple change like that takes your stat from flawed to useful very quickly. All stats are flawed. If tackles are useful, TF is 100x more useful as it stands. One thing that I notice is that Buf has players on all three lists, but have the worst run defense in the game. So teams game plan to almost exclusively run against them and their front 7 have obviously benefited from it in this perspective at least. The Raiders are most likely in there because they have a good pass defense and most teams game plan to run against them as well, but I will have to do more research to see if that is true.